Located in the summer constellation of Cygnus, the North American Nebula (NGC 7000 at the middle left of this image) and the Pelican Nebula (IC 5070 on the right) form a complex of hydrogen emission nebulae located just a few degrees east of the first magnitude star Deneb. Filling over 10 square degrees of sky, the complex shines from the hot hydrogen gas that is energized by the new stars formed in the region. 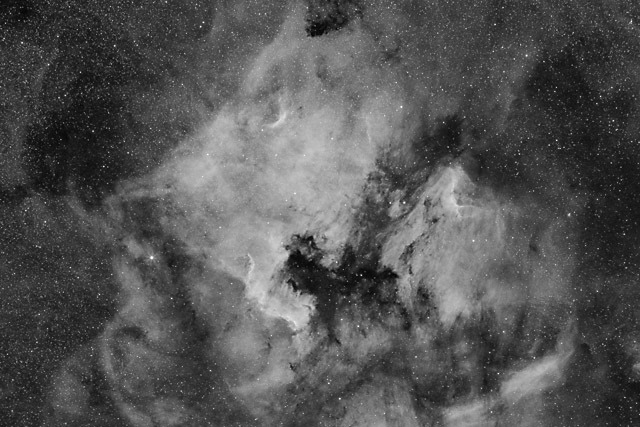 For this reason, the nebulae respond well photographically to a narrow band Ha filter. Software Used Images Plus 5.5 for camera control, calibration, stacking, digital development, smoothing and noise reduction, multiresolution sharpening, and star size and halo reduction. Photoshop CS5 used for levels and curves, high pass filter, star shrinking, screen mask invert, and unsharp mask. Gradient Xterminator for gradient removal. Registar for registration and stack alignment. Carboni Tools for additional noise reduction and smoothing. Notes This is the deepest hydrogen alpha image I've taken through my Canon 200mm f/2.8 prime lens. While the total exposure time comprises almost a full day of data capturing (23.5 hours), the large amount of data was need to bring the noise level down to a manageable level. Because this data was captured during many warm summer evenings, the camera sensor was fairly noisy. I'm overall pretty pleased with the comparatively low noise, as it allowed me to bring out some very faint areas of this complex. The structures in this region are very intricate, and I think this image displays these features rather well.